From the invention of the press, to the elevator, acrylic paint, and the electric guitar, technological progress has helped drive changes in ancient art forms (in these cases, literature, architecture, painting, and music). But sometimes entirely new art forms (such as the movies) spring from new technologies. In A Philosophy of Computer Art, Lopes argues that computer art is a new art form. While it is true that digital encoding is having an enormous impact on traditional arts, the essence of the computer is not digital encoding. Rather, computers run computational processes or algorithms that enable them to modify a display based on input. Computer art takes advantage of this to achieve interactivity, where the audience of a work has a part to play in how the work unfolds. Billions of people already know computer art through video games, and Lopes shows how highbrow computer artists work with the same basic materials and opportunities as video game designers. Articles from a series of special joint issues of the American Society for Aesthetics Newsletter and the American Philosophical Association Newsletter on Computing and Philosophy. Links are to the version on the ASA web site, aesthetics-online.org. excerpt an excellent opening of what I hope will be an interesting discussion that attempts to unravel the relationship between new forms of narrative, expression, and communication and the previous ones. He weaves together an excellent web of references from Umberto Eco to Clement Greenberg to Lev Manovich and references a wisely chosen group of artworks to bolster his argument. excerpt The sudden ubiquity of computers, with their facile ability to turn abstractions into experiences, has tangled many facets of culture into a complex conceptual knot. Lopes proposes to sort through some of the strands relevant to art. He enters much contested territory and takes on an ambitious project. 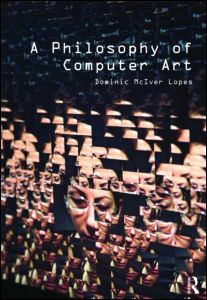 … Lopes’s book makes an important contribution to our understanding of computer art by virtue of his definitions, distinctions, and arguments. He presents some very interesting ideas and raises many critical questions. excerpt lucidly and convincingly births a seminal text that explains and ultimately persuades why computer art is a new art form. …Pursuing perennial questions of aesthetics… Lopes unpacks topics of display, interactivity, and daringly, the question of whether video games are art. …Lopes uses a clear, straightforward writing style to describe complex questions that have not, until now, been asked of computer art. …Every art student enrolled in a Digital 101 course should read this book. Summing Up: Essential. excerpt The poet William Carlos Williams once said (in the 1950’s) that “a poem is a machine made out of words.” The time during which he said it—before computers became common—makes the remark especially interesting. …Lopes’s rigorous definitions of a few terms builds a kind of machine made out of words. That has both a philosophical and a game-like quality to it in that we are interested in what the consequences of the definitions are, what they lead to. We are interested to chase down, infer/deduce the consequences. And that is a game-like activity that’s playful. Which is not out of place here, given Lopes’s take on the place of computer games in computer art and the place of logic in philosophy. excerpt The audience for the arts is declining, according to a recent study by the U.S. National Endowment for the Arts. Attendance at live performances, museums and galleries dropped 15 per cent between 2002 and 2008, and the downward trend holds for all age groups and most educational levels. The predictable reaction: calls for enriched arts funding. However, the fact is that the arts are doing better than ever, as new technologies secure them a place at the heart of everyday life.